This is an extremely popular route for most international travellers to visit Hampi. In fact, it was the backpackers & hippies of Goa that discovered the charm of Hampi and help put it on the world tourism map. Many travellers hear about Hampi for the first time when they are in Goa from fellow travellers and then decide to visit. Travelling to Hampi can be challenging, but it is well worth the effort. 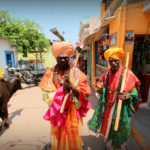 This article will give you all the information needed to plan and execute your trip to Hampi from Goa. How to get from Goa to Hampi (and back)? There are 3 main ways and below we have tried to elaborate about each method in detail. BY TRAIN: This in our opinion is the best and most convenient way. Check the table below for information on the trains and their timings. You will have to book your ticket well in advance especially if you are looking to travel on weekends during the peak season (November to January). You can check the availability and book your train ticket online on the Indian Railways Website or Travel Sites. Alternatively, you can get any ticketing agent in Goa to help you with the booking. BY BUS: Several state-run and private buses depart every day from Goa to Hampi. Check the table below for information on the bus timings. You can check availability and book your buses online on the State Road Transport Website or private sites like Redbus or MakeMyTrip. Alternatively you can get any ticketing agent in Goa to help you with the booking. BY PRIVATE CAR: You can also hire a private car with a driver to take you to Goa. This is the most expensive option of all but it is also the most flexible. You can use services of a travel agent in Goa to arrange this anytime. At Explore Hampi we also offer our guests an option for pickup from Goa. Submit an inquiry on one of our itineraries and choose pickup options from Goa, we will send you a detailed quote. How much time do I need to explore Hampi? Hampi is the kind of place where you can't just visit and tick places off a check-list. You must really soak it in and immerse yourself. Most travellers leaving Hampi regret that they did not spend enough time here, don't be that person. Plan to spend at least 3 to 5 days in Hampi. If you cannot dedicate that much time then at minimum spend 2 full days here. 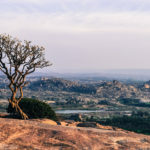 What are my accommodation options in Hampi? 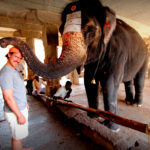 Do I need a special permit or any documentation to visit Hampi? No. If you are a foreign national all you need is a valid visa and passport. What is the best time to visit Hampi? September to March: The season in Hampi starts in September and peaks in December/January and ends by March. This is the time when the weather is the best in Hampi and allows you to spend more time outdoors. It can get really crowded towards December end and January. So make sure to plan your travel ahead of time. April & May: The weather is unforgiving in the summer months of April and May. Most businesses that depend on tourist inflow shut down for these months in Hampi. Many guest houses, resorts and hotels run special promotion and drop prices as much as 30 - 50% during this time. June to August: The temperatures drop during these months, but since it is still considered off season, the prices are low. The entire landscape transforms with the monsoon and there is lush greenery. This is a good time to visit Hampi if you are looking for a budget trip. What should I bring on my trip to Hampi? Hampi has warm weather especially during the day between 10.00 AM and 3.00 PM. So wearing comfortable light colored clothing is recommended. Please note that keeping the local cultural sensibilities in mind, we recommend you wear tops that cover the shoulders and bottoms that cover up to the knees. Carry sunblock or sunscreen lotion, sunglasses, hat or an umbrella. Insect repellent is also recommended if you are staying in a guest house. With these curated itineraries all you have to do is come to Hampi, we take care of the rest. Your accommodation, travel and tours are all integrated into one seamless experience. We can arrange pickup from Goa for you.